Speedlights pack a huge amount of light for the size. Very portable, and loaded with sophisticated features, owning a speedlight is a must. A simple choice. Studio lights and the larger portable flashes such as the Profoto B1 TTL flash (B&H / Amazon) , offer a lot more power than speedlights. Exactly how much more powerful, isn’t all that easy to gauge. There’s very little available as direct comparison. Even the specs aren’t directly comparable. 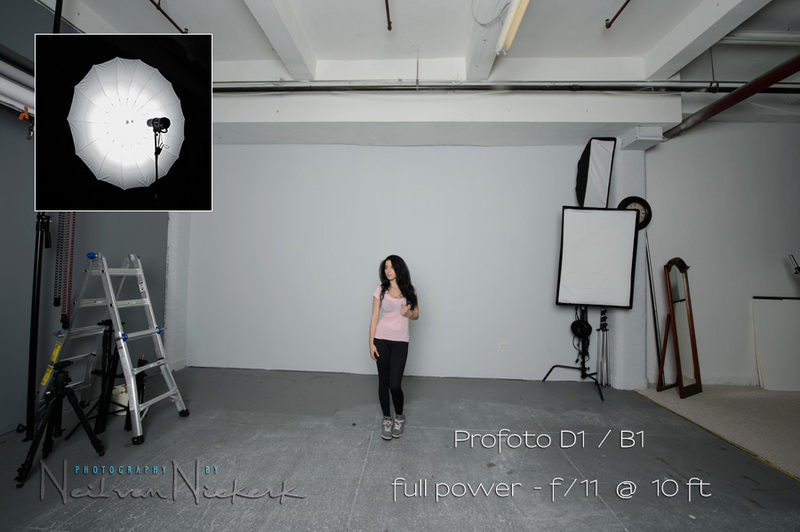 Speedlights’ power is given as a Guide Number (GN), and studio lights’ power is usually given in Watt-second. Not an obvious translation between the two of them. The Profoto B1 flash (affiliate) is quite powerful, offering 500Ws as a maximum. It also features TTL capability, and can be wirelessly controlled. All this gives the B1 a flexibility approaching that of speedlights. The question then inevitably comes up just how much stronger the Profoto B1 is than a speedlight. Stated in another way: how many speedlights would you have to gang up to match 500Ws of studio light output? Let’s see then how studio lights compare to speedlights / speedlites in terms of output. I had a model, Melanie, in the studio to do a series of test photos. I used a Nikon SB-910 Speedlight (affiliate) vs a Profoto D1 Air 500Ws studio light (affiliate). The studio-bound Profoto D1 is similar to the B1, except that the D1 doesn’t run off a battery. Comparing the Nikon SB910 set to 50mm zoom, and 1/1 manual output … vs the Profoto D1 at full output. I had both flashes at 10 ft away from Melanie, who stood a few feet from the studio wall. The speedlight offered a surprisingly small aperture value for that central spot. About 1 stop under the much more powerful D1 / B1. Yet we can clearly see just how wide the Profoto D1 throws its light. So there is obviously a lot more light coming from the Profoto head than just what would give correct exposure for a small central area. Notice that the shadow behind Melanie is less pronounced with the Profoto D1 head, because of the amount of light being bounced around the place. As an aside: the exposure values for the SB-910 very closely matches what we’d expect from the guide number. 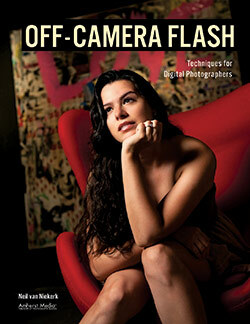 Check this tutorial on how to use the guide number of your flash. The next step would be then to use a light modifier for both flashes, and see where we end up. Adding the huge Westcott 7′ Parabolic Umbrella (affiliate), equalized the comparison between the studio light and the more compact speedlight. Here is the review of the Westcott 7′ Parabolic Umbrella. This light modifier is massive and would spread the light quite widely. I added the inset photo to show how wide the light from either flash spreads into the umbrella. This didn’t appear to have an obvious effect on how evenly the parabolic umbrella spread the light into the studio area. This implies, that to get the same exposure (with the same light modifier), we’d have to gang up 6 to 8 speedlights to match 500Ws. This might seem like an unequal comparison, but a speedlight will most likely always be your best option for portable lighting. Small and powerful. 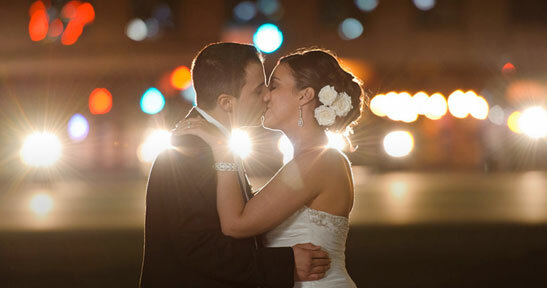 A top-of-the-line speedlight is very sophisticated, with TTL capability and high-speed flash sync. Every photographer should own a few. For sheer brute power though, it can’t match a studio-type light. And this is where the Profoto B1 battery powered flash (affiliate) shines. True wireless control and with TTL capability, it becomes very easy to use and set up on location. This also takes us in an interesting direction. It is quite often mentioned that powerful portable lights such as the Profoto B1 are quite expensive. But if you break it down into a comparable number of speedlights and wireless transmitters (and possibly battery packs), then the all-speedlight option becomes quite expensive as well. An interesting consideration. Which is the best flashgun, and what should I buy? Why would a 3-stop difference in output equate to having to use 8 speedlights to match the studio light? I was surprised at how closely the speedlight matched the B1….until the spread of light was better contained!! Each stop increase is twice the power so the number of speedlights increases exponentially. FWIW 7 speedlights would be good for 2.7 stops!! No idea on cost but it won’t be much difference! Not quite as powerful but much, much more versatility in a smaller package. And the batteries surprises me every time (300 shots without problems). And if you buy the speedlights used the price is very competitive. I know this is going to sound like an advertisement but it really is a mere opinion from a satisfied customer. Owning multiple speedlights and not being able to add up their power inside one modifier kept bothering me for quite a long time. 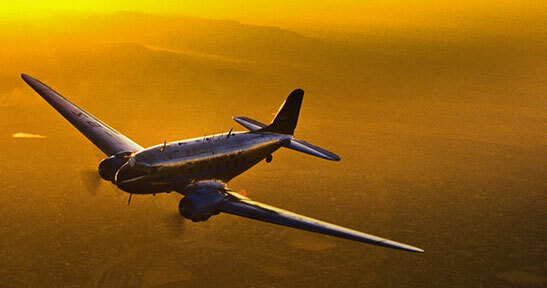 Recently tho, I discovered a company called phottix that in my opinion is very underrated! 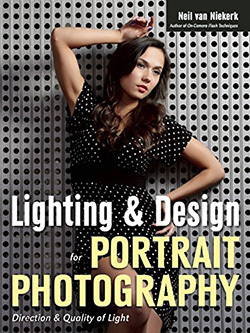 They have so many great products that solved most of my problems with speedlights. Check out phottix multi boom 16″/28″ with flash brackets and phottix ftx2 and ftx3. They also have a wide range of light modifiers that could be mixed and matched with those pieces for a decently easy setup. hope that helps! Your comparison makes me appreciate a little more the power of my speedlites. Thanks Neil for your tutorials and postings – I’ve learned so much. If you are going to be in a studio, having 3 speedlights just doesn’t make any sense (except if you want to be a contrarian) because (1) the huge extra cost (easily $1,500 for the speelights alone) and (2) the trouble of balancing them all. A single Alien Bee 800 will completely outpower all of them, solve your problem for less than $400, deliver a beautiful light and be easier to manage. 3 stops = 2 x 2 x 2 speedlites. 8 x SB910 at $500 each, 8 sets of batteries would probably be another $200, plus triggers (on the cheap you could set them to optical slave), clamps (probably $50 unless you DIY with bungee cords), hmm. That’s probably more than the Profoto. or you could just buy an einstein for $500, and save $1500. Currently I use 7 Nikon Speedlights on location and it’s very flexible and fast (with aoktec radio triggers). I must admit it’s not a question I’ve thought about nor probably ever would have. My theory being use what I have and if not powerful enough, add another light. If I run out then off to the hire shop I go. Would it be too simplistic to have a speedlite on a stand and pop off a shot at full power aimed at a light meter then repeat with the studio strobe? The difference in f-stop between these lightsources tells you how much more powerful the studio light is in relation to the speedlight. Most of the time I really like your articles, on this occassion though it just seems that you’re producing content for contents sake. Paul, yes, that would be too simplistic. Metering for the two flashes directly would give you the results of the first comparison – which isn’t a true reflection of their actual power. I think the second illustration here is indicative of what’s really going on. As for “content for content’s sake” – if I go by the comments here and on Facebook where I posted this link, there’s actually a lot of curiosity about this. And ultimately this is my site, and the content is free, and I don’t owe anyone anything. Thanks Neil! 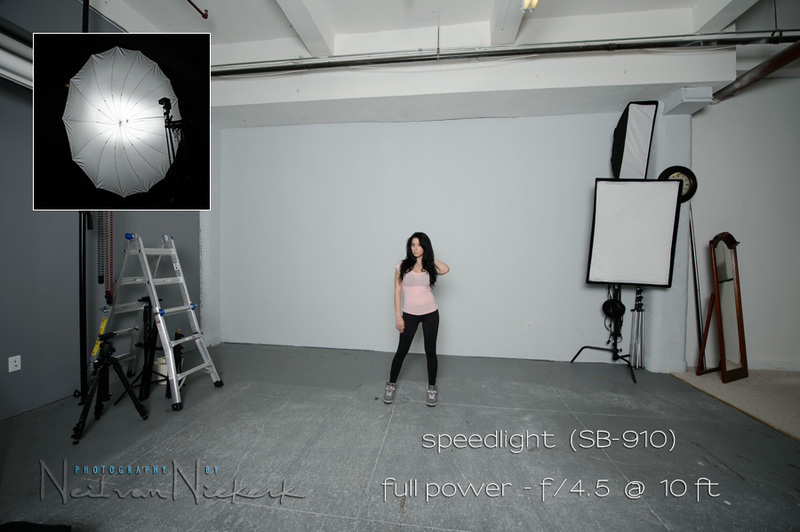 Comparing speedlites to studio lights based on output per dollar certainly brings a new perspective. As you suggest, it’s easy to make the case for a Profoto B1 versus a comparable number of top-of-the-line speedlites. I wonder, however, if the same conclusion would be reached comparing budget speedlites to budget studio lights. I can buy eight manual-only, optically-triggered Youngnuos for about $400. What portable studio lights would give comparable output at a similar price? I’m asking because I don’t know … would appreciate any answers from readers. Thanks Neil for another informative posting. When working out on location, it’s always a consideration whether to go for the convenience of Speedlights against the more powerful but bulkier studio lights. At one business portrait session earlier in the year, all of my studio lights stopped working and just refused to fire. I had 24 business women waiting to have their portraits taken, a mix of Nikon Speedlights and an Elinchrom Quadra saved the day for me! I always take a couple of Speedlights to all my assignments, and just accept that when used for portraits I’ll most likely be working at f/4 to f/5.6 rather than f/11. Wonder how CL360 would perform as compared to Profoto B1? Let’s not forget you can zoom the head on the speedlight to benefit that central illumination. What setting did you use Neil? I was wondering how LOW can the Profoto B1 go? When doing environmental portraits I find that speed-lights work great because of the ease of gelling them to match the room lighting, and because of how low I can set the output. Sometimes I find myself shooting at 1/32 power on a SB900. Could I get that low an output on a Profoto B1? I can dial the Profoto B1 down by 8 stops from what you see there. Obviously the speedlight will be able to give you smaller blips of light than the Profoto. From my understanding though, the profoto has no Hss option. So now all of that power is useless above 1/250 unless one wants to hassle with a nd filter. 1/250 @ f/3.5 @ 100 ISO … with an ND filter, and the Profoto B1 in a 1×3 stripbox. I wouldn’t use the word “useless” as loosely as that. You lose about 2 stops of light with HSS. So it is near impossible to use speedlights in HSS mode with a diffuser or softbox, with flash in bright light. You need juice! If Hss is offered I will be all over this thing! Nd filters are just too much of a hassle when shooting weddings in my opinion. In the example above, it makes perfect sense as a more than viable option. Thanks Neil! The unit for the energy emitted by a studio flash (or anything else) is Joule, which is abbreviated J. Energy is power integrated over time, so one Watt over one second gives us one Watt-second, which is the same thing as one Joule. Watt-second is abbreviated Ws, nothing else. It’s most definitely not written W/s, since that’s Watts per second, which is power differentiated, not integrated. An embarrassing mistake that I propagated throughout my site. All fixed now! Thank you. This is a Great discussion Neil. I started out using the Nikon speedlights as my primary gear. Versatile. Easy to set up, portable I loved them and still do. But they are inadequate to overpower the sun, unless as you point out you gang up multiples. That gets expensive. I quickly discovered the Einstein lights, and then more recently the powerful 360ws quantum flash, and variations such as the cheetah light. So why isn’t there an easy translation of Ws vs GN? For me I think, it all boils down to the quality of light. Light modifiers, whether the umbrella, softbox, or reflectors, or even zooming the speedlight make a huge difference to the final result. Why set up four lights, when you can do it with one? Use the Youngnuo line of speedlights… the YN-568-II and run that same test… :-) 8 of these would cost barely the price of 2 sb-910 and definitively will give a B1 a very very hard time not only in quality of light but output as well. And battery management for 8 units is a real pain, unless you are using Godox V860. I like the comparison in concept. It’s a real battle I’ve sat outside with a 500 ws bowers and then ganged 3 sb910s with no modifiers at 70mm zoom. I was within 1 stop at full power. But that changed based on modifier / reflector on the Bowens. Once you put this in a softball then the Bowens will out power the speed lights by 2 stops. I’m agreeing with your results. 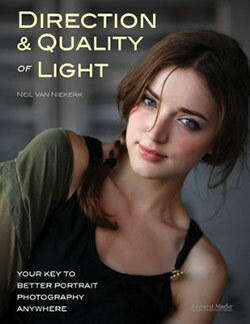 If you want both quantity of light and quality of light the studio light is the way to go. Note that the speed lights will not cover a softbox or 7′ umbrella as equally as a studio light (my opinion in my limited testing) Strobes tend to have smaller hotter highlights even in equal size softbox which tells me it’s a smaller light source. Note this would be my observation of final images and if you actually worked zoom down below 24mm with well aimed strobes we could probably solve this. I love my strobes and studio lights.. they each work great and have a place. There´s another point of view that haven’t really been discussed here – the versatility of 3-4 Canon 600 EX-RT:s compared to a single Profoto B1. With the Canons you can use one as a key light, one as a background light and one for ambient lighting. On modern SLR:s, especially with full frame sensors, you can easily turn up the ISO to 200-400 without having too much noise. 3 600 EX-RT:s with lightstands, soft boxes, umbrellas and a beauty dish, a 5DmkIII on ISO 400 and a Canon STe3-RT transmitter = a very versatile and portable studio, and also quite powerful. 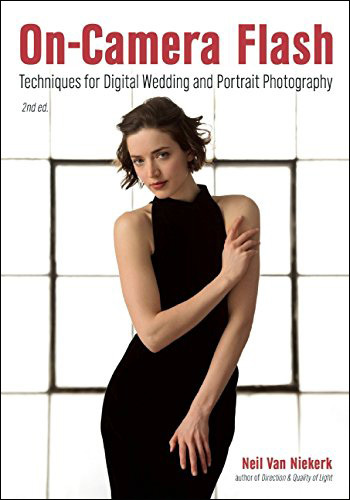 I use it to, for example, shoot full length portraits at f/8. Neil, I admire your technical expertise as well as ethics. 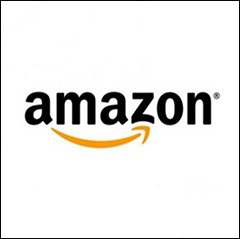 I was happy to see the (affiliate) text throughout your website. This kind of transparency and disclosure are unique in the photography world. Thanks so much for providing a detailed comparison between the Profoto B1 monolight versus the power of a speedlight. If you plan on shooting during midday then speedlights wont do it. I guess buying a light modifier that can take up to two speelights will do the trick in most situations. I was a ble to shoot some great portrait at 4pm shooting against the sun using the SB-910. Buy some used SB800’s they’re the most powerful flash with GN 41 at 35mm. According to my measurements with a softbox during bright sunny day, you can overpower the sun by one stop using 3 SB800’s. Now add a softbox to those and see how much power you effectively have. Almost 2 years since you wrote this, I am coming across the post (via Google searching) having been out of the game for several years when it comes to off-camera lighting and the whole speedlites vs studio lights discussion. Thank you for your contributions to the photography world! I’ve tested the power of the sb5000 at full power 1/1 in hss with the shutter speed at 1/250. the other problem is the flash duration. even if the speedlight is faster, to have a good t0.1 to freeze water splash etc t0.1 must be around 1/8000. so with a godox 600W you have to use the strobe power setted 1/128….this mean 4.68Ws in power (t0.1=8130). 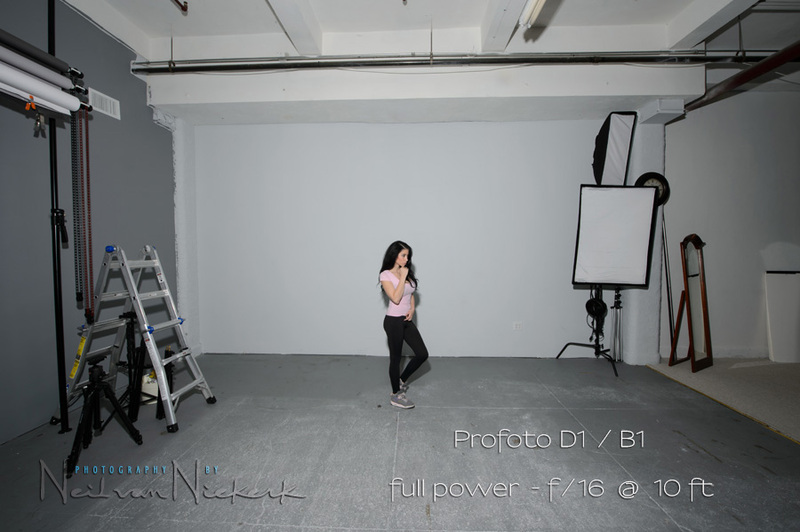 with a profoto D2 500W you have to use the strobe power setted to 5 (this mean 15.9Ws t0.1=8600). so a godox 600W is 3 time less powerful than a D2 500W regarding the flash duration. obviously all that strobe are much more powerful than 9 speedlight. if you want to overpower the sun in a sport action photo, you have to shoot with t0.1 at 1/8000 at least so…around power 5 of the D2 500. not bad… ;) with a speedlight at the same t0.1 you have only 1/16 of the power and with a nd filter if you wont to work at 1/200 or with a shutter speed 1/250-1800…you can only use hss so….you loose much much much power. I know this is an older thread, but I found the discussion very helpful. 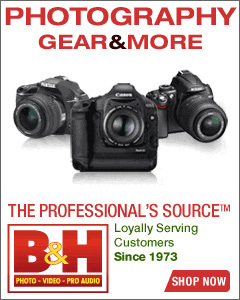 I have used speedlights many times while on location, but I bought some older ones like sb-24’s. This kept the cost low and I wasn’t too worried if my light stand took a tumble. I always use them manually because I like manual flash better than ttl. Anyway, I also own some power packs and heads which I use most often because of the extra power available and at times having the modelling light is a big convenience. Also, I don’t like the idea of having to put a lot of “stuff” together because it’s more stuff for me to lose and leave on a previous location. I guess it all boils down to your budget and the job you are attempting to tackle. Thanks Neil for attempting to address this issue.